Most of my knitting lately has been Christmas related so I haven't had anything to post, but with the shop's extended holiday hours I managed to get in a few non-holiday knitting projects. The first is a Calorimetry for the shop. It is made out of d've Autunno which is a beautiful yarn that just doesn't seem to sell very well. Sarah and I have no notion to discontinue this yarn so I decided to knit up some samples so that people could see how truly great it really is. 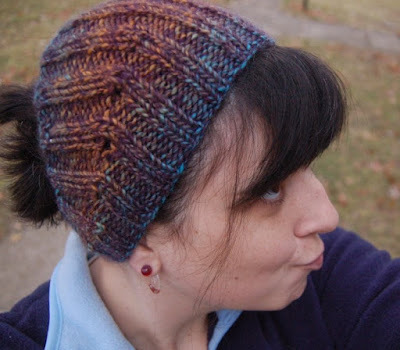 The second and third projects are both Abalone hats made from Autunno. 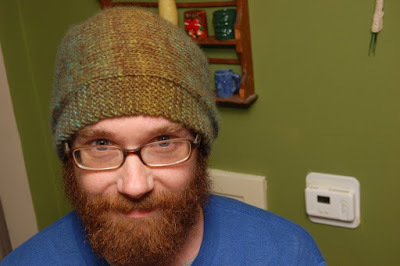 Philip's hat is a green and blue colorway and my hat was made using a two row stripe of the green and blue colorway and a two row stripe of the magenta and green colorway. 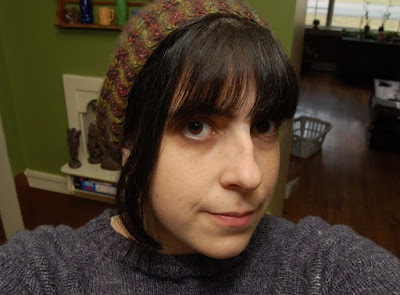 This is Sarah's favorite technique to use with Noro yarns so I knew that it would look great with the Autunno. The best part about both of these hats is that the color changes line up perfectly at the grafting line so they look completely seemless. Finally, I finished my hempwol sweater quite a while ago and never posted. It is a top down raglan of my own design. It took me a few tries to get the sleeves and the bottom to my liking, but now it is done and it fits like a glove. I wore it into the shop the other day and it kept me comfortably warm through the snow and the insane heat of our backroom. The yarn is Hemp for Knitting's hempwol and I have to say that it is the perfect weight and warmth for Kentucky. Plus, this sweater only took me 5 balls which is amazing since I am not a small girl. 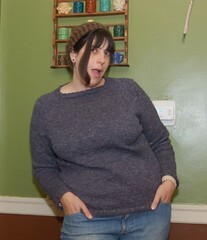 I am planning another raglan out of the same yarn, but since it is third in my sweater queue it will be a little while. If you are interested in any of my finished Christmas knitting projects, they are now up on my Ravelry project page. I thought about doing that cardi wrap in the hempwol, but I really want it in orange or teal and the hempwol doesn't come in a good shade of either so I am going with 220 instead. Will you be ready for a cardi wrap KAL around mid-January? I have to check with Reallyn, but I plan on being done with my Christmas knitting and Philip's smoking jacket by then and I want the wrap to be my very next project. I figure if we start in January we should finish in time to wear them before the weather starts warming up. Hm, maybe. I do have Mariah slated as my next sweater. The wrap could probably be done quicker though. I'd have to get some yarn too. I'm still working on the huge herringbone jacket too.